Nhan Tam Dental Clinic - Sinus lift and bone graft are the support procedure for dental implant placement, the cosmetic of the gums play an important role in dental prosthesis attachment. What is cosmetic gum surgery for dental implant placement? According to Dr. Vo Van Nhan: Gums include marginal gum, attached gum, interdental area, attaching epithelium. 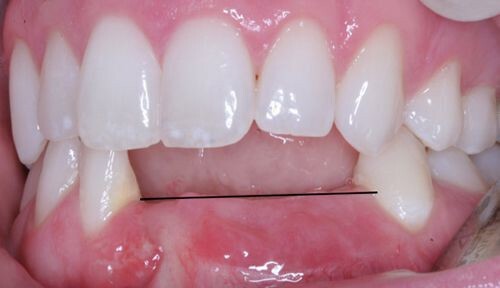 The marginal gum surrounds the tooth, about 1mm wide and forms the soft wall of the interdental area. This gum can be separated from the tooth surface by the periodontal probe. Attached gum is the next gingival part next to the marginal gum, attached to the alveolar bones by a system of collagen fibers. The interdental area is a narrow, V-shaped groove where the loose gum meets the tooth surface. Interdental gum is the gingival part between two teeth with a pyramidal shape. Too large interdental gum or no interdental gum at all cause cosmetic losses at the same time cause food buildup, creating cavities in the interdental area that develop peridontal diseases. Cosmetic gum surgery in implant placement is a technical stage to create cosmetic beauty for the gums. Because, after the teeth are lost for some time, the gums and jaw will begin to wear and recess, causing cosmetic loss. The gum at the tooth loss area does not only recess but also become pale, does not look as good as the gums in other positions. To overcome this situation, when placing implants, the dentist will also performs cosmetic gum surgery and to make patients more confident. Because of cosmetic and potential complications around the gums, when having dental implants or any dental restoration, the patient should ask the doctor to perform a cosmetic gum procedure to achieve good results after treatment. For more information on the mater or if you require dental implant placement, please contact Nhan Tam Dental Clinic directly, to receive detailed consultation from experts free of charge.